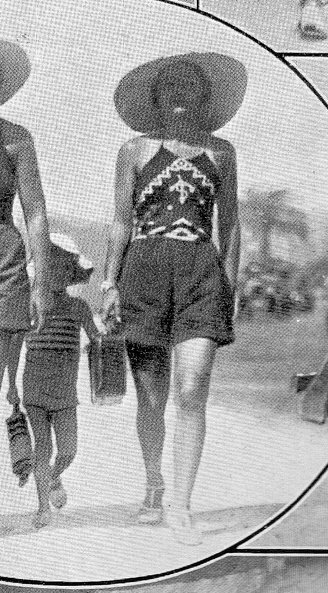 For months now, I've ben frustrated by my inability to find the perfect 30s style shorts...you know, higher waisted (higher rise), not toooo short in length. Well, since the weather is well near boiling, necessity became the mother of invention today when I took matters into my own hands and turned a pair of repro. 30s style trousers that I just hadn't been wearing because I think I shrank their length at some point), and, inspired by By Golly By Gum's recent jeans-into-shorts conversion, I made what I could not find. Voila! I was on a roll, so I made the halter top out of an old synthetic silk scarf. I got the idea from an earlier 30s issue of the french fashion periodical, Modes et Travaux (apparently, it was really popular to turn tourist scarves into little beach bags and tops. I'll have to share a tutorial or two. Really took me no time at all to whip up the top). Finally, a note on the shoes: I got these for FREE: I took some of my old clothes into this used clothing shop and got these cuties with the store credit my clothes earned! They had these sort of punk rock studs sewn on them, so I cut those off and now they feel sort of like Busby Berkeley 30s beach sandals. In fact, the whole outfit makes me feel like a chorus girl from Dancing Lady or 42nd Street (though the inspiration for the look came from a 30s photo of two ladies on the beach). THERE, that's better!!! Just need the sun hat! That's an AWESOME outfit! You look completely fabulous! Looks great on you, I have done this with old scarves too, ans sometimes 2 sewn together with the corners turned over on a drawstring. Loveee the shorts! They really look lovely on you. Miss Rayne: YES, I was thinking of trying that idea. Saw a 30s gal with similar and think it's brilliant!! fabulous job!! love the top too. I would love to see the scarf tutorial! You did such a great job; both the shorts and the top look wonderful! Yes, please do the scarf tutorial! Don't you look gorgeous! I, too, am now lusting after the scarf tutorial! You make shorts look divine! Really nice summer outfit! Looks good. This is great! Do make a tutorial! I was thinking of turning a silk skirt(fits like hell but the fabric is nice)into a beach top, and I should have enough fabric left for a head scarf too. But the scarf transformation should be far easier (we are talking total lack of skills here, but frustration can give one wings :)). Plus, there some very cool 70's scarves around with geometric patterns that look very deco or could pass for the real thing, I think they would lend themselves marvelously to this kind of project. The one thing that worries me though in relation to my body shape is the the triangular look narrow at the top and wide at the bottom this sort of ensemble creates, as I have pretty narrow shoulders as it is. But I'll have to give it a try. Perhaps a big beach hat could balance things out. Not that I have one. Ooh la la! You look gorgeous! Lovely combo. Oh as always you look lovely and such a clever and easy idea, may try idea if I can find the right scarf. Ahh perfect to the beach! Tres, TRES bon!!! Nothing like a bit of make do 'n' mend to make one feel smug! A totally free outfit! Which looks smashing to boot! What a great idea!! I've been having trouble finding good high waisted shorts that don't look hipster, you've inspired to try this with some too short pants as well! Also the top is lovely, all in all looks like a great combination of cute and comfortable in this heat! Thanks again for your comments, everyone!!!! Okay, I'll try to do a tutorial once I've got a couple of things under control over here!! Stay tuned? I've never done one before, so this could be interesting!! That outfit is totally cute! For sewing shorts up from scratch, give a look at 70's vintage patterns because alot of those pants and shorts directly copied the 30's and 40's too, with high waists and wide legs. The top is adorable, totaly cool and awsome! Please post a tutourial! I am blushing over your sweet compliment !! Thanks so much !And : I am dying to see a picture of you with my bird's nest hat !! !